On Monday we took a look at four teams that will be up this season. Today we’ll examine four teams that will be down as compared to where they were last year. No Devin Ebanks. No Da’Sean Butler. All kinds of problems for the Mountaineers, who are the only team from last year’s Final Four to begin the season outside of the AP top 25. Bob Huggins’ squad lost a lot of what made last year’s team so tough to handle with the depatures of Ebanks and Butler. The 2009-10 Mountaineers got by on their ability to suffocate opponents with their brutally physical play combined with Butler’s brilliance on the offensive end. Now much of the responsibility falls to forward Kevin Jones, who averaged 13.5 points per game as West Virginia’s third option. Can Jones step up his game this year when defenses single him out as the guy they have to stop? If Jones struggles, then the Mountaineers will have a hard time duplicating even some of the success they enjoyed last year. Reports coming from preseason practices aren’t too encouraging. 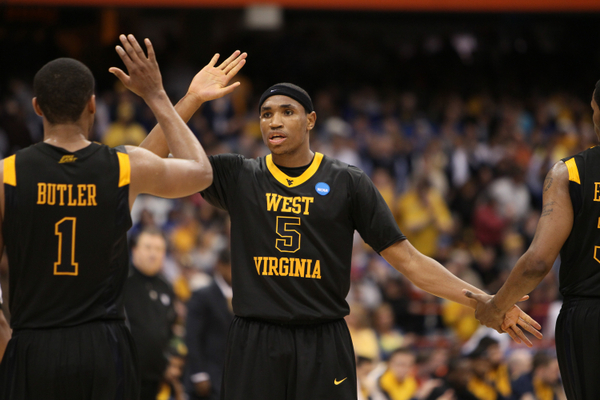 Huggins recently told the Charleston Gazette that freshmen Kevin Noreen and Noah Cottrill “look lost” at practice. And that was after Cottrill sparked rumors when he was introduced but didn’t participate in West Virginia’s Midnight Madness. There also was the case of Casey Mitchell, who was suspended for a violation of team rules but is now back with the team. These aren’t the kinds of stories that equate to success in the regular season. This year might be one to forget in Morgantown. The Big Red was the last year’s feel good story, upsetting Temple and Wisconsin en route to an unprecedented run to the Sweet 16. And what was the reward for America’s favorite brainiacs turned basketball stars? A return to obscurity. Cornell lost its X&Os wizard in Steve Donahue when he opted for the greener pastures of the ACC, taking the head coaching gig at Boston College. The Big Red lost all-time leading scorer and 2010 Ivy League Player of the Year (Ryan Wittman), the sparkplug and catalyst of its NCAA Tournament run (Louis Dale) and six other seniors from last year’s squad. That would be a lot of attrition for even a team like Duke to endure, and there’s no doubt Cornell and new coach Bill Courtney are headed for a big step backward this season. The Big Red was predicted to finish third in the Ivy League, which would require a number of players to step up fill the voids left by the likes of Wittman and Dale. Cornell needs big seasons from proven players like point guard Chris Wroblewski and forwards Adam Wire and Mark Coury. Then the Big Red will need some of its unknown pieces (one if its four freshman or maybe junior transfer Anthony Gatlin) to emerge if Courtney & Co. hope to compete for a fourth straight league title. The West Region is the only region in the tournament without a double-digit seed still alive, but that doesn’t mean it is without some dreamers, as the recent blueprint for the mid-major Cinderella, Gonzaga, takes on Syracuse tomorrow. And Mark Few knows that his Zags won’t be intimidated by the importance of this game. But in order for them to get the job done, they’ll need to figure out the Orange zone. For their part, Syracuse will again be without senior center Arinze Onuaku and head coach Jim Boeheim isn’t particularly pleased about having to play the early game today after having played late on Friday night. With rumors swirling about Few possibly leaving Gonzaga for the Oregon opening, will he run for the potentially greener grass, or take his cue from Jim Boeheim, who has spent his entire career building one program? In the Milwaukee pod, Xavier takes on Pitt in what should be a heavyweight fight between two east coast grinders. These two teams met last year in the Regional Semifinal round, but a lot has changed in both programs since then. For Xavier, there is a new coach and a new star player, while Pitt is missing most of its leading men from last year, but has had a new batch, including sophomore guard Ashton Gibbs, step up. Speaking of Xavier’s new head coach, there was this little exchange between Xavier coach Chris Mack and Minneapolis Star-Tribune columnist Jim Souhan before the Xavier/Minnesota first round game. So, make that Xavier 2, Minnesota 0. In a Washington Post poll of nearly 500 people, 66% of voters believe that Saturday’s Northern Iowa vs. Kansas game was a bigger upset than George Mason vs. Connecticut in 2006. Maryland’s Landon Milbourne said that he expects the Terps to play a different style against Michigan State. In addition to pushing the tempo, Maryland may also look to apply full court pressure. Michigan State is anything but healthy going into tomorrow’s game. Not only are Kalin Lucas and Chris Allen suffering from foot injuries, but Delvon Roe is still suffering from pain in his knee. According to Cleveland.com’s Doug Lesmerises, Georgia Tech is much more talented than your average 10 seed or 12-loss team, led by potential first round pick Derrick Favors. Over the next two days in a series of separate posts, RTC will break down all 32 of the first round games using our best analytical efforts to understand these teams, the matchups and their individual strengths and weaknesses. Our hope is that you’ll let us know in the comments where you agree, disagree or otherwise think we’ve lost our collective minds. Here are the Friday evening games. This is a very tough game to call, so let’s start with what we know about it. The Zags, no stranger to cross-country travel, come into Buffalo after an 11-day layoff where St. Mary’s took Mark Few’s team behind the woodshed and beat them handily in the WCC Tournament championship. Florida State comes in having dropped its quarterfinal game against NC State in an effort that had their fans shaking their heads in disgust. So needless to say, both teams are looking for a fresh start here. The Zags are always dangerous, and this year’s squad led by Matt Bouldin and Elias Harris has the offensive firepower to score with just about anyone in America. Merely an ok three-point shooting team, they tend to rely on the drives of Harris and mid-range game of Bouldin to create offense. However, they don’t tend to respond well to teams that crowd and push them around, but unfortunately, FSU is just such a team. The Seminoles enjoy the nation’s top defensive efficiency, and while they have the opposite problem of finding points, they should have no problem putting the clamps down on the Zag scoring options. The question here comes down to whether the FSU defense, anchored by 7’1 Solomon Alabi and 6’9 Chris Singleton’s combined four blocks per game, is better than the Gonzaga offense, and we think that it is. And as up/down as the Seminoles were in the ACC, they never came close to losing to the likes of Loyola Marymount and San Francisco, as Gonzaga did this year. The Skinny: The Zags this year aren’t quite as good as they usually are, and they’re facing a team that will shut down their biggest strength. FSU wins this one by eight points to get a date with Syracuse. Here’s another one that’s got people confused. For good reason, too. All year long we’ve been waiting on Georgia Tech to do something with all that talent, and now they’re playing better basketball, just in time. Oklahoma State’s showing against Kansas State in the Big 12 Tournament will cost them some support, but we’re going to excuse that performance. That was a tired basketball team, playing their third game in a six day span with K-State at the end of it — and the Wildcats were coming off of a five-day rest. Georgia Tech is going to go inside to Derrick Favors and Gani Lawal like crazy, but when the Yellow Jackets actually shoot the three, they shoot it well. Defending the three is a glaring OSU weakness, so it will be interesting to see how often Georgia Tech eschews their big men in favor of launching it from the arc, because those shots will be there. So…good outside shooting, great inside players…sounds pretty good for Tech, right? The question will be whether or not they can get to that point in their offense. Georgia Tech ranks in the bottom twenty of Division I teams in terms of turning the ball over. Can the Jackets, then, find a way to keep James Anderson from shredding them or Keiton Page from raining threes? The Skinny: Oklahoma State won’t have to exert too much energy guarding the three, since Tech’s propensity to turn the ball over will take care of some of that. The Cowboys have been getting more and more help from their role players, and we feel 9-7 in the Big 12 is better than 7-9 in the ACC this year. It’ll be a great first round game, but we like Oklahoma State in a close one. Georgia Tech is fifth in the conference race at 4-3, yet the only ranked ACC team besides the Yellow Jackets is Duke. GT has played average since the start of ACC play, but is 4-1 in their last five games to climb back into the thick of the ACC standings. The Blue Devils, on the other hand, are coming off a bad road loss to Georgetown, their third road loss in a row. Although Duke is known for their three-point shooting and second-most efficient offense, they give up even fewer points than the Yellow Jackets per game. The main problem with Duke is how inconsistent they are. They held Gonzaga, Clemson, and Florida State to 41, 47, and 56 points earlier in the year, but gave up an average of 88.5 points to N.C. State and Georgetown. In their earlier matchup against Georgia Tech, Duke held GT to just 71 points, but 6-28 shooting from beyond the arc led to a loss. The Blue Devils only shot 9-29 from three on Saturday, so they are going to have to shoot closer to 40 % if they want to win the game. The Blue Devils have not lost back-to-back games all year, and given their 13-0 record at Cameron Indoor Stadium, look for Duke to remain atop the ACC tonight. Before Maryland’s last game against Clemson, we claimed that Maryland was not a lock for the tournament with an RPI of #50. They lost to Clemson by nine in that game, but their ranking in the RPI only dropped to #51. Virtually in the same scenario, the Terrapins will now face another solid ACC team on the road. In Florida State’s last four ACC games, they have recorded three victories, but they are still looking for that signature win over a top conference team. With a win against the second place Terps, the Seminoles may finally get that big victory to improve their tournament resume. With just five losses and an RPI of #29, the Seminoles are likely in as of now. Florida State’s solid defense will be keep them close against Maryland’s high scoring offense. Clemson, with the third best defense in the country, held the Terps to just 53 points in that game, and the Seminoles have the best defensive efficiency in the nation. Clemson held forward Landon Milbourne to just three points on Sunday, so he will have to play better to give UM a chance tonight. Florida State’s leading scorer in Solomon Alabi only averages 12.9 points per game, so this game should be close no matter how well FSU plays defense. 1. I’d be fairly shocked if Gonzaga is any lower than a #3 seed when the brackets are unveiled in March. In fact, I’d be fairly shocked if the Zags lost again this season. Think about it: they’ve already notched wins on the road against the three teams most likely to shock Mark Few’s team by dispatching Portland, Saint Mary’s and San Diego on a single road trip. They have one challenging non-conference game left against a rebuilding Memphis team in which Gonzaga will surely be favored. The only team I could see possibly stunning the Zags is Pepperdine and their explosive guard Keion Bell. The Waves only fell by seven in the Kennel this past week behind Bell’s 37 points, but they’re still 7-13 on the season and I highly doubt Bell is going to post 37 again on a stingier Gonzaga defense. Win out and Mark Few is looking at 27-3 (16-0) heading into the WCC tournament where they could finish with a 29-3 (18-0) overall record and an RPI in the top-20 with their only losses at Michigan State, at home against Wake Forest and Duke in MSG. That sets up Gonzaga for a #3 seed in the Spokane regional, meaning two quasi-home games until the regional (and they could be in the Salt Lake City regional). German import Elias Harris has spear-headed the Zags hot streak. He’s averaging 16/8 and shooting nearly 60% in a tremendous debut campaign. 2. Remember that Greivis Vasquez guy on Maryland who’s had a pretty damn good career? After scoring in the single digits in his first four games and struggling mightily with his jump shot in Maui, the brash and often polarizing emotional sparkplug for the Terps is heating up in a big way. And that’s bad news for the rest of the wide-open ACC. Vasquez has now scored in double figures his last 14 games including a 30-point outburst at Wake Forest and 22 in a big home win over Florida State. He played his most efficient game Saturday in the blowout win over NC State, notching 19 points on 7-11 FG and 3-4 3pt. Despite the concerning start, Vasquez is now playing like the ACC POY contender he truly is. His 43% FG is only second to his 44% as a freshman (but he only needs three more shots to match the amount taken that season), his 39% 3pt is far and away a career best, and he’s also contributing with 6.1 APG and 4.6 RPG, solid totals for a 6’6 guard. I fully expect Duke to win the ACC- they’ve already played two of their three most difficult ACC games- but Maryland is absolutely a contender to finish second behind Vasquez, the continued improved play of Landon Milbourne and Eric Hayes (46% 3pt), plus the superb coaching of Gary Williams. 3. Other than maybe Georgetown or Notre Dame, the most disappointing team in the nation last season may have been Baylor. The Bears entered the season fresh off reaching the NCAA Tournament just a few years following the Dave Bliss fallout with Scott Drew being lauded as one of the best young coaches in the game. Even though a late-season Big 12 Tournament and NIT push healed some wounds, the 5-11 Big 12 mark a season ago was still a campaign to forget. What led to the downfall? For one, Baylor ranked #103 in defensive efficiency in 2008-09. During their crippling six game Big 12 losing streak, the Bears surrendered 95 points to Oklahoma, 89 to Missouri and 83 to Texas Tech. In a related story, Baylor is ranked in the top 25 this week and ranks 41st in defensive efficiency. What has sparked the change? A big reason is the human eraser Ekpe Udoh in the post, a Michigan transfer who ranks sixth in college basketball in block percentage (Baylor ranks first in the nation in the same category). Baylor as a unit has also turned up the intensity on the defensive end, ranking third in the nation in opponents two-point FG% behind just Mississippi State and Florida State. Baylor hasn’t forgotten how to score, either. They rank 15th in offensive efficiency and eighth in effective FG%. Anyone who watched the Bears go toe-to-toe with Kansas at Allen Fieldhouse last Monday knows this team can play. 1. Other than Kansas students, graduates, former players and all former or current residents of Lawrence, was there anyone in this fine country of ours rooting for the #1 Jayhawks to beat a depleted Tennessee team, a group of kids and a stunned head coach that just dealt with the suspension and/or dismissal of four of its regular rotation players? All of the events that occurred in that two-hour window in Knoxville Sunday was a release of pent-up frustration and anxiety from a tumultuous week in which Tennessee was considered a prime threat to upend favorite Kentucky in the SEC one day and counted out as a SEC contender that must scratch and claw the final two months for an NCAA berth the next. 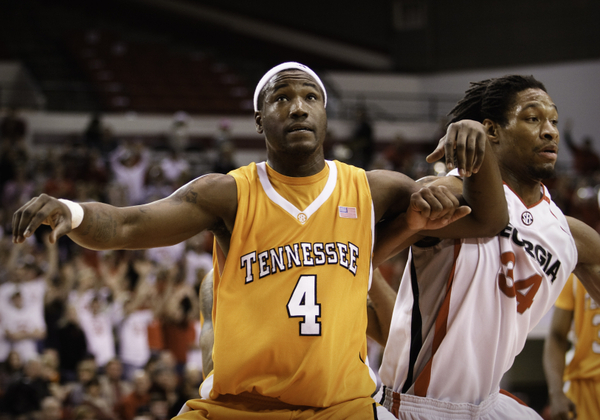 Renaldo Woolridge banking in a three, the Vols maintaining their lead with Wayne Chism and J.P. Prince on the bench with four fouls, the coach’s son Steven taking a critical charge, a miracle Skyler McBee (one of three walk-ons playing substantial minutes) leaning trey that iced the game, and coach Bruce Pearl aiding the Volunteer mascot in waving the orange Tennessee flag while the sounds of Rocky Top reverberated throughout Thompson-Boling Arena summed up what college basketball should be about. Bill Self pointed this out after the game, but there are some moments during a season when a team officially becomes a team instead of a group of individuals. Even though Pearl would gladly reset the timer to New Year’s Eve and prevent four scholarship players from getting in that car, sometimes it takes a catastrophic occurrence that truly tests the mettle of a unit for them to band together and accomplish lofty goals. I think it’s fair to say Tennessee became a team Sunday night. 2. As long as Mike Anderson is employing his Forty Minutes of Hell hellacious press on demoralized opponents, especially on a home floor where his team has won 30 consecutive games, Missouri should never be totally counted out of the Big 12 race. Losing DeMarre Carroll, Leo Lyons and Matt Lawrence from an Elite 8 squad isn’t easy to overcome, and certainly the ceiling for the Tigers isn’t nearly as high, but the ultra-talented and quick Mizzou backcourt should have enough firepower to carry them to an NCAA berth. Missouri carried an impressive 12-3 record into their Big 12 opener with #10 Kansas State Saturday, yet their overall resume wasn’t incredibly awe-inspiring with their best wins over Old Dominion, Illinois, Georgia and Oregon and opportunities lost in defeats at the hands of Richmond, Vanderbilt and Oral Roberts. The win Saturday was clearly a statement that Missouri will be a contending force in the Big 12 for that #3 spot behind Texas and Kansas. Anderson looks to have a workable combination with experienced seniors J.T. Tiller and Zaire Taylor (evident by Taylor’s tie-breaking 3 with under a minute to play) making plays in late-game situations, a promising sophomore backcourt duo of Kim English and Marcus Denmon carrying most of the scoring load, and a defensive unit that ranks seventh overall in D efficiency, first in turnovers forced and gives Missouri a fighting chance on any night. We are back tonight courtside for what might be one of the best early season games of the year with #3 Villanova travelling down to Washington, DC to take on Maryland. Coming into the season, a lot of people expected this to be a huge game, but some of the hype died down after the Terrapins lost back-to-back games in Maui against Cincinnati and Wisconsin. At the time we were down on the Terrapins, but we are willing to forgive them a little for what might have been a little jet-lag (yes, we know the other teams had to travel far except for Chaminade). And it turns out that the Bearcats and the Badgers might have been a little better than advertised coming into the season (ask Coach K about the Badgers). Tonight Gary Williams and his Terrapins have a shot at regaining some respect from the rest of the college basketball universe against Jay Wright‘s Wildcats. A win over the top-ranked team in the Big East would be a big boost for the Terrapins’ chances on Selection Sunday (less than 100 days away now). While most of the nation’s attention will be focused on the two standout senior guards Greivis Vasquez and Scottie Reynolds, the key to this game might be on the inside. Antonio Pena has filled in the void left by Dante Cunningham, but the Wildcats are very thin on the inside particularly with Mouphtaou Yarou likely out for the season with hepatitis B. That leaves Jay Wright relying on Pena and local Maryland product Maurice Sutton on the inside against a group of Maryland interior players that lacks a big name but is fairly deep with Landon Milbourne, Jordan Williams, and Cliff Tucker in frontcourt. If either Pena or Sutton gets in foul trouble, the Wildcats could be in trouble. One other interesting storyline to watch is Villanova’s 6th man Taylor King, the former Duke McDonald’s All-American who transferred after his freshman year. As you may be aware, the Maryland student body doesn’t exactly like the Blue Devils. Even though he’s no longer at Duke, King would no doubt love to stick it to the Terrapins and their fans who will certainly be ready with plenty of taunts for the former Blue Devil. Be sure to join us for another edition of RTC Live at 7:30 PM. Update: For those of you who are interested, our correspondent is already there so he will be covering the undercard of the BB&T Classic (George Washington versus Navy). The More They Stay the Same… #11 UNC 89, #9 Michigan State 82. Ok, can we now all just agree that UNC just has Michigan State’s number? For the fifth straight time, and the third episode within one calendar year, North Carolina made Tom Izzo’s Spartans look like charlatans on the basketball court. How is this possible? How can a team like Nevada hang with the Heels a few days ago for most of the game, and a loaded, deep, talented, athletic team like MSU continually get punked and embarrassed by the same squad? Well, motivation helps. Ed Davis (22/6) and Larry Drew II (18/6 assts) both had career highs in points, and in watching the game, it seemed as if Carolina could get and make nearly any shot it wanted. Michigan State, for some reason, seems to think that it can run with Carolina, and as they learned for the third time with the same core of Lucas, Morgan, et al., they cannot. Why do they try? The thing about MSU is that they weren’t the second-best team last year, and they surely aren’t this year either — but aren’t we used to this with Izzo’s teams by now? They typically underachieve in the regular season, only to overachieve in the NCAA Tournament. The problem is that teams that are routinely blown out do not win national championships. Granted, Michigan State made a run in this game to get the margin back to a respectable score, but Carolina was never seriously threatened after the first ten minutes of the game. So what went wrong other than allowing UNC to shoot lights-out again? How about 2-20 from three (and many of those misses were open looks), a terrible evening from deep for a team that came into this game shooting 37% from distance? How about allowing point guards Drew and Dexter Strickland to torch the MSU defense for repeated forays to the rim for easy buckets (9-12 FG)? How about the rough-and-tumble Spartans getting outrebounded (36-34) by the admittedly bigger (but tougher?) Heels? Honestly, the reason we thought this game would go Carolina’s way was because they were playing at home, but we’re not sure that it would have gone any differently had they played this game on Mars. Michigan State simply cannot get over on Carolina, and it’s starting to get ridiculous. At least Raymar Morgan (18/6) looked healthy and played well, right? ACC/Big Ten Challenge. We’re deadlocked at 3-3 going into the last day, and yeah, it’s gone exactly as we predicted so far. Which of course means all five games tomorrow will go crazy — expect all kinds of upset specials. Seriously, though, we still think it comes down to the BC-Michigan game tomorrow night. Winner of that one wins the Challenge (our choice: UM). #6 Purdue 69, Wake Forest 58. Wake played well enough for a half to win this game, but the Deacs don’t have enough offensive threats beyond Al-Farouq Aminu when he has an off game (12/10 on 3-11 FG including 6 TOs) and they turn the ball over like it’s their job. But we knew that already. Purdue, on the other hand, is only getting production from their Big Three of Robbie Hummel (11/11 on 3-11 FG), E’Twaun Moore (22/4/3 assts) and JaJuan Johnson (21/9/3 blks) — the rest of the team only scored fifteen points. That’ll carry the Boilermakers against the lesser teams, especially in Mackey Arena, but we have concerns about when they start playing athletic teams like WFU that also have multiple serious scorers. Wake played superb defense, holding Purdue to 34% for the game and 1-15 from deep, but their endemic problems with ballhandling and lack of a three-point threat will be problematic all season. Northwestern 65, NC State 53. Northwestern is quickly becoming our second favorite team of this season (behind Portland). With the injury troubles that they endured to start this season, we would have completely understood if the Wildcats had simply packed it in and hoped for next year. But they didn’t. Beating Notre Dame, Iowa State and NC State isn’t exactly equivalent to Michigan State, Purdue and Ohio State, as they’ll face in the Big Ten, but the key is that NW is gaining experience with winning and they’re doing it in environments away from the comforts of home. Tonight Michael Thompson stepped up with 22/4 and Jeremy Nash also chipped in 12/8/4 assts in the win. The Wildcats could realistically enter Big Ten play at 10-1 by the end of this month. Good for them. We are currently in the midst of ESPN’s second annual college hoops tip-off marathon, but that doesn’t mean the rest of the college hoops world comes to a halt. Tonight at 7 pm, the Maryland Terrapins will host the Fairfield Stags, and we will be there to provide you with any and all minutiae that happens to get lost in your ESPN Gamecast. The Stags are 2-0 on the season, but this is a team that is far from 100%. Greg Nero, their best returning player, has yet to suit up after undergoing sinus surgery during the off-season, while junior forward Warren Edney, a starter that averaged 9.1 ppg last season, is still suffering from an ankle injury. But that doesn’t mean the Stags are coming in empty handed. Senior forward Anthony Johnson, a 6’8, 235 lb forward, is finally healthy after battling blood clots in his lungs. He’s averaged 15.5 ppg and 10.0 rpg thus far. Shimeek Johnson (11.0 ppg, 9.5 rpg) and Ryan Olander (8.0 ppg, 4.0 rpg) provide size inside. But the star thus far has been 5’11 freshman Derek Needham, as he comes into this game with averages of 16.5 ppg, 5.0 apg, and 3.0 spg. Maryland, on the other hand, has a chance to be really good this season. For starters, they bring back arguably the most entertaining player in college basketball in Greivis Vasquez. Not only does Vasquez fill the stat sheet, but he is liable to do just about anything on a basketball court, including curse out his own fans. Maryland has a solid group of perimeter guys, including Eric Hayes, Landon Milbourne, and Adrian Bowie, but the key to their season will be how freshmen Jordan Williams and James Padgett handle D1 basketball. Join us tonight for another exciting RTC Live, this time from College Park.